“But Brad,” you may ask, “what the hell are you talking about?” Warranted, my good friend, warranted. As most things these days, it all started with a blog post back in 2003. Then, following some discussion, it was decided that the President of the Internet would be he or she who ranked #1 on Google for the keyphrase “president of the internet“. In 2004, the first President of the Internet took office and has remained in office for the past four years. In these past four years, we’ve seen the e-mail system being overrun by spammers, deteriorating to an almost unusable state. We’ve lost many good people to the World of Warcraft. My own brother among the victims. It is high time for a change of leadership. We need someone to clean up the broken corners of cyberspace and protect people from getting trapped in fantasy lands. That someone is me. 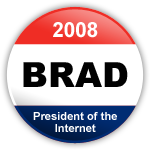 To support me in my campaign for President of the Internet, simply add one of the following buttons to your web site. You can simply copy the snippet of code into your site. If you would really like to help out, a blog post linking to this article would be most excellent. You may be asking yourself, “Why not shoot higher and go for King of the Internet?” First of all, you aren’t elected king, you just are the king. Second, the Hoff has already claimed that title. Though, he better hope his majesty Chuck Norris doesn’t catch wind of this.